He is sired by Texas Ranger, out of Measles. He is a full brother to Measles Super Ranger, Mr. Measles, Ranger's Super Measles, Texas Ranger Jr., Ranger's Measles, Cheetah & Ol' Measles. Texas Measles has the unusual distinction of being a sire of corkscrewed horned cows. 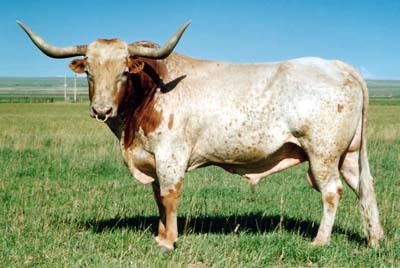 He is known for siring beautiful females & one Reserve World Champion bull. Texas Measles is the grand sire of Gun Man's dam. Use him to add cork screw horn.